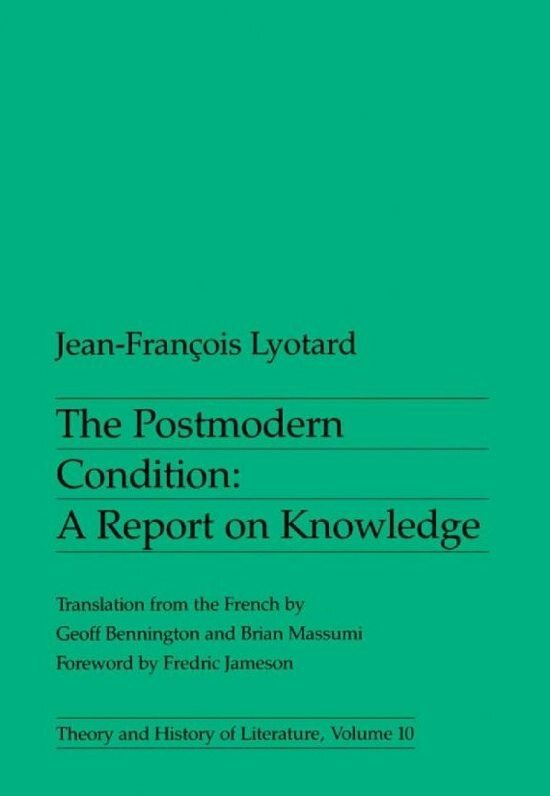 When The Postmodern Condition: A Report on Knowledge appeared in print in 1979, it was in response to a request from the Conseil des Universités in Quebec to a famous famous French philosopher, Jean-François Lyotard, an authority on epistemology, to “report” on the state of “knowledge” now that the University was entering in to the computer age. The request and the commission was an extraordinary one, almost ahead of its time. It would be more than ten years, for example, before the Bibliothéque Nationale would computerize its vast holdings. The personal computer was a kit for hobbyists, and in 1979, BASIC programming language was only four years old. When Steve Jobs and Stephen Wozniak introduced the Apple II in 1977, it was difficult to imagine what the average person would do with such technology. The infamous and famously expensive “Lisa” model of the personal computer was still four years in the future, when Lyotard published this book. And yet, he appears to have grasped, as did the clients in Quebec, that the computer (in the abstract) would change knowledge and it was his appointed task to figure out how and what the consequences would be. 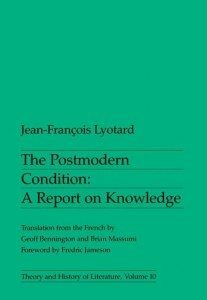 As was pointed out in the first part of this series, Lyotard disposed of the “old” vision of knowledge as a metanarrative, some kind of expansive explanation that encompassed all questions and presented all the answers. The mere idea that there could be a metanarrative had died over the early decades of the 20th century as the Enlightenment and its children, from Idealism to Marxism, proved inadequate to the actual workings of history and incapable of adequately explaining postmodern events. Out of the smoking ruins of atomic warfare and the painful memories of the Holocaust, where language was reduced to silence, Lyotard proposed that in the place of metanarratives, there would be “little narratives,” which could only be local and never overarching. However, if narratives are now small and contextual, then without the metanarrative, the problem of legitimation arises. The metanarrative/s had been legitimated by metadiscourses and supported by leading thinkers or by the state, but upon the collapse of such narratives, a new “condition” for or new epistemology of knowledge had to be established. Given that the client was a group of universities, it should come as no surprise that The Postmodern Condition is about education, and predictably, the most extensive discussions of this book can be found in the field of, not so much philosophy but, education. Lyotard de-idealized the role of the university and reevaluated the place of learning in an age of what he termed “pragmatism” in which people would be educated so that they could “perform” or fulfill the needs of the society. Society, Lyotard explained, is not “organic” or natural but, because of technological advances in cybernetics made during the Second World War, contemporary social structures have evolved into “systems.” Indeed Lyotard compared society to “a giant machine.” “The true goal of the system,” he stated, “the reason it programs itself like a computer, is the optimization of the global relationship between input and output–in other words, performativity.”Lyotard understood that, in this system, the university would serve and produce two kinds of students, the “professional intelligentsia” and the “technical intelligentsia.” If the goal is to “improve the system’s performance,” then knowledge can no longer be presented as metanarrataives or in chunks, or en bloc, as Lyotard put it, then knowledge must be broken down into useful and directed units, “served à la carte to adults” for purely practical purposes. The new system, driven by machines and technology–computers and technology–is not only based upon optimal performance geared to maximum efficiency but is also based in information, which now becomes “knowledge.” Knowledge for the sake of knowledge and education for the sake of learning was now outmoded and people need to be trained specifically to be of use within the system. This “theocratic” system does not care about or take into account what individuals–now discounted along with the “self”–want or need.“The self does not amount to much, but no self is an island; each exists in a fabric of relations that is now more complex and mobile than ever before,” Lyotard said. If society was once imagined to be about the “self,” a metanarrative in itself, then the question becomes what does this new kind of social system demand of its denizens? What the system cares about, needs, demands, is performativity. More important is who runs (owns) or rules this system; in other words, who is in charge of information (knowledge)? “Increasingly, the central question is becoming who will have access to that information these machines must have in storage to guarantee that the right decisions are made. Access to data is, and will continue to be, the prerogative of experts of all stripes. The ruling class is and will continue to be the class of decision makers,”Lyotard predicted. And Lyotard has a larger point to make, for, in the past, knowledge was produced and contained within the prevailing metanarrative, but once the metanarrative has fallen, then it must be acknowledged that knowledge (information) has always been created within language games and, in addition, it is now true that knowledge can be legitimated only through these games which are “played” through narration, or speaking, uttering, creating discourse. But who is allowed to narrate/speak? What is the criteria of competence? “..the language game known to the West as the question of legitimacy–or rather, legitimacy as a referent in the game in inquiry. Narratives, as we have seen, determine criteria of competence and/or illustrate how they are to be applied. They thus define what has to right to be said and done in the culture in question, and since they are themselves a part of that culture,they are legitimated by the simple fact that they do what they do.” Thus the decline of the “lost narrative” became a crisis in legitimation. Lyotard’s way out of the bottle of legitimation, so to speak, was to strike the “meta” and replace it with the “little” or local narrative and in order to establish even a little narrative, an intermediary step needed to be taken, a new set of rules needed to be established. The metanarrative, now extinguished by incredulity, would be replaced by the language games of Ludwig Wittgenstein. The language game, or language itself, rises to the foreground in societies that value information systems. These necessarily agonistic language games, in which utterances (knowledge) are given and received and acknowledged, are governed by contextual (local) rules. The agreed-upon rules exist through the consent of the players who are positioned in a confrontational (agonistic) relationship and any utterances made outside of the rules do not “count.” In other words, as in chess, language games have moves and one moves (utters, speaks) within the existing restraints. That said, there is room for critique or paralogy within the structure by making an unexpected move that is within but challenges the language game, changing the game. Legitimation is forged, not out of narration or seizing the “right” to speak, but by being a skillful player, and this idea of optimal performativity, when applied to language games, becomes a legitimating tool. here are consequences to playing the language games, which now replace the metanarrative and the implications of the new means (games) of conflating knowledge with performativity will be discussed in Part Three of the series.